Above, raised beds at Wayside's Walton Street facility. In partnership with Oakhurst Dairy, Wayside operates a dairy buying cooperative for Cumberland County food pantries. By purchasing milk and other dairy products together in bulk, the pantries are able to share cost savings while providing their clients with nutritious and highly sought after food. An innovative program to distribute unused medical nutrition formula to patients in need. Formula is used by patients who require feeding tubes, which may be needed by patients undergoing cancer treatment. After completing treatment, patients may have extra formula, which cannot be returned to distributors. To provide this unused formula to patients in need, Wayside has become a formula pick-up center for patients and drop-off center for donors in a partnership with Maine Medical Center Cancer Institute and New England Life Care. To learn more about the NEEEDS program, contact Karen Schilling at (207) 396-8524 or via email at SCHILK@mmc.org. An outreach program of the University of Maine Cooperative Extension to provide fresh fruits and vegetables to food insecure individuals and families in Maine. Wayside works with the Extension to distribute the produce grown at a number of HFH gardens to food pantries throughout the county. For more information about Harvest for Hunger and how to donate, click here. A cooperative program between the Department of Inland Fisheries and Wildlife and the The Emergency Food Assistance Program (TEFAP) within the Maine Department of Agriculture, Conservation and Forestry. This program provides a means for hunters to donate all or a portion of their hunt to a family in need. For more information about Hunters for the Hungry, click here. An annual summer series of collaborative, community building meals at Portland's public gardens. Hosted in collaboration with Cultivating Community and supported by a number of partner organizations and businesses, these gatherings are a chance for the community to enjoy a free dinner, meet their neighbors and explore the gardens. For a schedule and more information about Pop up Picnics, click here. A federal program that helps supplement the diets of low-income Americans, including elderly people, by providing them with emergency food and nutrition assistance at no cost. TEFAP provides food and administrative funds to states to supplement the diets of these groups. Wayside Food Programs works with the Maine State Department of Agriculture to administer and distribute the food for this program to eligible food pantries and soup kitchens in Cumberland County. Wayside maintains a raised bed garden at its Walton Street facility to grow fresh vegetables and herbs for use in its community kitchen. Volunteers help maintain the garden throughout the growing season. Our garden is part of the Maine Harvest for Hunger Network. In addition to our 7 raised beds, we also maintain a Pollinator Garden and are members of the Portland Pollinator Partnership. 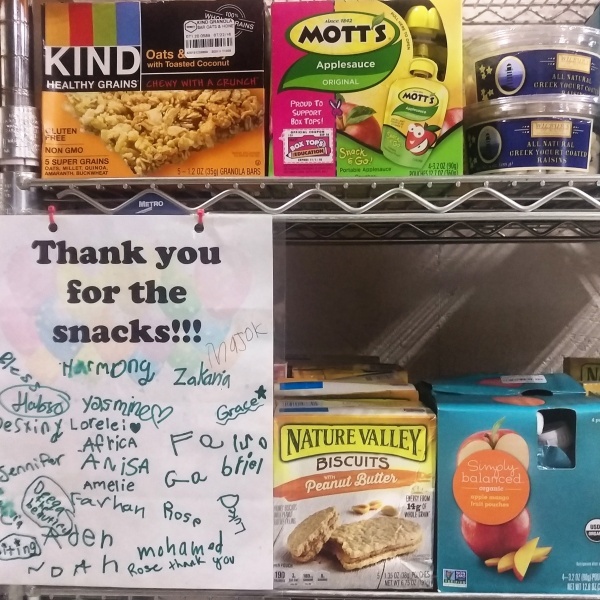 "The snack food helps fill the gap while people get more acclimated to the different food programs... For many of the people I see, if they know their kids have something to eat, it takes a lot of the stress off their shoulders." "Young people volunteering with our program this summer were able to participate more fully as a result of having some sustenance to hold them over until free lunches in the park. None of the youth were eating breakfast before coming to our site and snacks made a big difference." "We have been able to eat snacks together in groups which feels like a natural way to have regular nice interactions as a community." "Wayside has really helped support and strengthen the healthy options for the kids at the YMCA. Children who are hungry in the afternoon now have some incredible and healthy choices."